The wider and more prominent sole delivers a more stable ride for the On Cloudflyer. Inch-perfect fit and generous padding provide exceptional comfort to most runners. Relatively light and runs much lighter. Versatility on the road regarding distance and speed is noted by countless runners when using the Cloudflyer. Rolling through the gait cycle is effortless, according to numerous runners. Superb lockdown in the heel area comes as a general consensus among runners. High-quality materials and the undeniable excellence in craftsmanship ooze out of the shoe. Some runners were slightly surprised by the less than ideal ground perception of the On Cloudflyer. Durability is a feature a few runners wanted to improve. Traction gets a little sloppy when used during wet conditions based on several observations. The On Cloudflyer carves a nice niche in the industry because of its comfort level and Cloutec technology. Without any obvious and standard arch support technologies, the Cloudflyer allows neutrals to moderate overpronators get the most out of it. If not for the hefty price tag, this would have been a shoe that runners would be making a beeline for. I have been running with On Cloudflyer for more than 1,000 km (in two different pairs) and with so much time wearing them, I think it is good time to give this incredible shoe a review. The Swiss brand is well known for their “Cloudtec” technologies. These are half decoupled cushioning pods that provide quicker release from the ground and intend to adapt to everybody’s unique running posture. With the second statement, whether you are overpronator or natural runner, On Running claims that you can use any of their models. I have mild overpronation therefore, I chose Cloudflyer, which has 12 cloud pods that also provides enough support for the long runs. I use my Cloudflyer in many different occasions. I used them for long runs up to 25km, and for short and fast runs. I used them on the treadmill and on the asphalt. I used them in a rainy day. I can say that apart from rainy days, the shoe is very suitable for all conditions. During the long runs, you really have to thank “cloudtec” technology for allowing the shoe to be lightweight. During your race day or fast runs, you will experience the “push back” from the ground. Cloud pods work very efficiently. One comment I can make is, on the treadmill I always felt the ground much more than I did outside. So if you are a treadmill runner, you can consider other alternatives that provides more cushioning. I can confirm general comments from many users about grip level during rainy day; it is more or less like driving around with slick tires. Somehow, I felt like I need to be carefully otherwise, it would be easy to lose balance. Cloud pods create another level between the feet and the ground, which increases “flight time” during your runs. I can say with high confidence that this results to a feeling of “running on clouds”. Even with the support it gives and cushioning it provides, it weighs just below 300gr (280gr to be exact) and I found that is a great weight for such a supportive shoe. I have mild overpronation on my left foot and improving overpronation on my right one, and I never experience any kind of bad feeling after I completed my runs. No pains or bruises on my feet. The mesh in upper part of the shoe provides good airflow during hot days. However, the protection from the rain is very limited. With the decrease grip on wet surface, I concluded not to use my Cloudflyer during rainy days. If you would use only one shoe (which I do not suggest), you have to consider other options. As a final words, my first pair was in Water and Flame (900km with them), and my second one is Rock and Black colors (200km with them), and both of them attract some attention with high quality of finishing. From the first time you open up the box, to any day you put them on or take them off, you feel the high Swiss quality in every single part of the shoe. After so many distance covered, I still hesitate to give away my old pair, since they look quite all right from outside. I washed my shoes twice and no single color change and/or quality problems occurred. 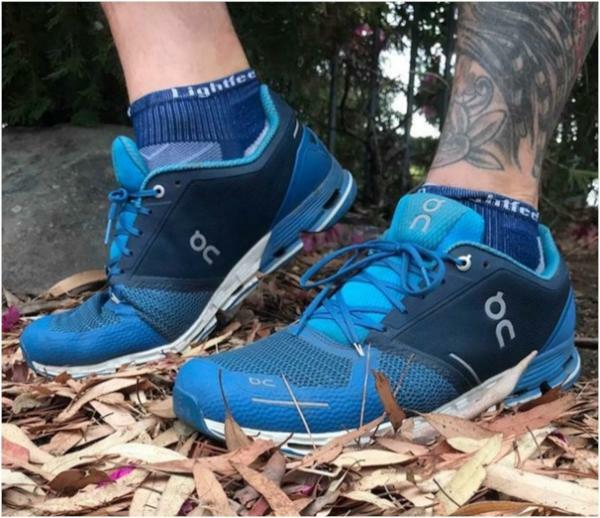 If you are an overpronator and looking for a shoe that you can rely on during your training or your race day, I would strongly suggest On Cloudflyer. When you process your order, it takes second thought due to high price (240 CHF as of now) but the shoe delivers what you expect for such a price tag. On Cloudflyer: Come fly with me! In the Cloudflyer, On Running aimed to create a lightweight shoe that still provides cushioning, support, stability and reduces overpronation. This is a huge goal but there’s more, the Cloudflyer is designed to be used for any distance and by runners of any level of experience even if their feet are a little wide. Is this possible in one pair of shoes? Have they achieved these sky-high goals? What amazing Swiss engineering have they used to attempt this gargantuan feat? Read on if you’re curious and I shall break it all down. Before I do so, I will direct you to read my review on the Cloudace. The reason for this suggestion is that On is unique in their technology. They use the Speedboard and Clouds; these elements are part of the midsole. In the aforementioned review, I introduce these pieces of tech and go into an explanation of their structure and purpose. In this review, I am going to consider details of these features assumed knowledge from here on. Now let’s take a look at the components of the Cloudflyer from the top down. The feel of the Cloudflyer as you slip your foot in for the first time and in fact every time after that is plush, snug and supportive. The Padding around the heel and ankle back to front is noticeably soft but not excessive, more than enough to provide that snug firm feel from a well-padded inner without volumes of weighty padding. Even barefoot the ‘dual density sock liner’ is silky, breathable and there are no pressure spots or seams rubbing on any part of my foot. The underfoot feel inside the shoe is also very cushioned and plush due to the ‘memory foam’ footbed On kindly provide (one of the best I’ve seen come inside a shoe). The tongue is also soft and plush. It is connected to the inner layer of the upper lining from about halfway down the tongue which maximizes the opening yet prevents the tongue from sliding down the side of the foot. The rest of the upper is comprised of a reinforced midfoot saddle which provides great midfoot support. There is a reinforced toe guard heat pressed over the mesh which itself has a nice loose weave look, and while being tough, it is also breathable. On describe the star pattern lacing to allow a better fit with less restrictions. The only comment I can really offer on this is that my feet (especially the left one) are a little wider and I have had no issues with the width in this shoe, so I suppose it does work. Overall, I love the feel and the look of this upper. All of its components work as a symphony to take me to the clouds! The 'V molded heel cap' is what I would consider semi-rigid, leaning slightly more in favor of rigid. Bear in mind that On is aiming to offer support and stability even for strong pronators at a lighter weight than their competitors. We need to examine whether or not this style of heel cup/counter does the job. Well, I think it does 100%, the materials allow it to remain lightweight at the same time as holding my heel firmly in place over the midsole throughout my gait cycle. Stability achieved, my heel felt supported firmly from both medial and lateral aspects and with no heel slip. As far as pronation goes (rolling in/flat feet), I have seen research evidence supporting that a semi-rigid heel counter is as effective as a rigid one at controlling calcaneal eversion. I tend to agree; this also holds true for my experiences as an overpronator wearing this shoe. Mission accomplished! A tick in every box for the heel counter and all with a lightweight piece of kit. In this area, On are especially unique. As described in my Cloudace review, they use medial and lateral rows of clouds with a hollow center that absorb impact multi-directionally and a speedboard to offer additional propulsion and support. The goal in the Cloudflyer was to offer cushioning and flexibility while still offering propulsion and support for any level of a runner with or without pronation. First up, I want to clarify, On uses a neutral last for ALL of their shoes and does not attempt to passively correct pronation through dual density wedges or guide rails. On aim to allow natural foot motion with additional support in some models such as this one. This, however, does indicate to me that although altering the natural motion On aims to achieve, you should be able to put your orthotics in these neutral lasted shoes. The extra stability in the Cloudflyer comes through wider, larger and thicker clouds and flair on the medial border of the rearfoot midsole offering more stability underfoot. The heel is noticeably thicker and firmer than the forefoot, where you can feel a slight difference between the blue and white sections of the midsole. This feature did not bother me, and I stopped noticing it after 1km or so. I ran distances between 5-10km in these shoes and found them ideal for either. I ran a combination of tempo, foundation and fartlek run, and I wasn’t disappointed. The surfaces I ran on were road, gravel, and treadmill. The ground-feel in these is quite intimate so as you can imagine. They are not great on gravel with rocks larger than .5mm. This is no issue however as they are road running shoes and not designed to be used off road. The other issue is that rocks get trapped between the clouds regularly, so I will reiterate, I do not suggest using them off road. I did notice that after 50km, the forefoot cushioning didn’t offer the same protection, lift and cushioning as they did initially. I attribute this to the fact that I am 88kg. I’m probably a little bulkier than the average runner wearing lightweight, low profile runners. I would estimate that these shoes would not have this issue for any runner under 80kg. Overall the midsole is well cushioned, supportive and lightweight. The outsole is low profile and situated only where it is necessary to add minimal weight to the shoe. You can see the white and blue area clearly in the picture. The white is midsole, and the blue parts are the rubber outsole. Typical of On road running shoes, this element of the shoe is divided centrally along the length and into segments at each cloud. I have found the outsole for serving its purpose perfectly, protecting the midsole, gripping the road and keeping the shoe light. On have aimed to produce a supportive, stable, cushioned road running shoe all in a lightweight package that can be used over any distance by any level of runner. 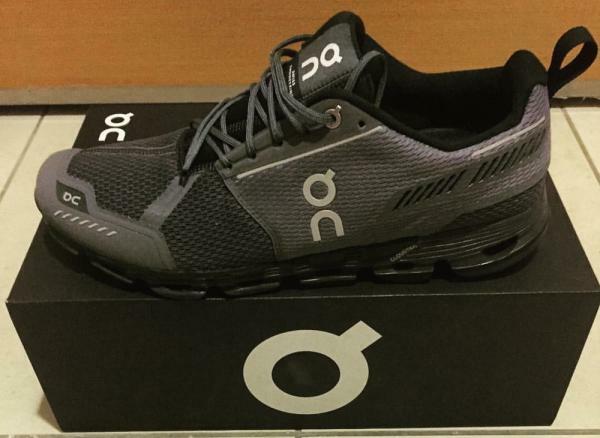 This is a massive endeavor for any shoe company even the Swiss-based up and comer On Running. The Cloudflyer at my size 13 weighs only 313g and has a 7mm offset. The overall fit of the shoe is slightly generous in length for a 13 but not so that it affects the choice of size. My experience with this shoe began with a fantastic unboxing experience (see the video below). With plush and supportive feel in the upper and midsole, this was capped off with runs that delivered pace over distance and greater top speeds than I had previously recorded during the sprint phase of my fartlek runs. The only complaint I have is the durability issue in the forefoot midsole which I attribute to my 88kg frame. I love the Cloudflyer and recommend it for a recreational runner or a competitive athlete on race day. On have definitely nailed the brief. Join me in the clouds and give this masterpiece of Swiss engineering a go! Responsive. Slightly overweight. Surprisingly nimble. I believe this is even better than the Cloudsurfer that I have been using for a very long time. The On Cloudfyer features an enhanced midsole. It uses innovative midsole elements that give enough amount of cushioning while promoting the foot’s natural movement. The midsole construction is enough to deliver a well-cushioned foot strike. The outsole of the Cloudfyer also features the innovative speedboard that is directly attached to the shoe’s outsole, delivering improved stability without adding weight. This shoe features a knitted upper mesh liner that offers a snug fit and added durability. The star lacing also wraps the foot securely. The On Cloudfyer is true to its size. Its semi-curved shape accommodates the natural curvature of the human foot. The heel is a bit narrow while the mid-foot and forefoot areas have a medium volume, so those with medium-sized fit can adapt well to its natural fit. This shoe is available in standard width. The outsole features the very notable 12 “clouds” Zero gravity foam for added cushioning and stability. This works perfectly with the low abrasion rubber pads that deliver added durability on high impact areas. The Central Channel delivers foot flexibility and the speedboard that is directly attached to the outsole offers reliable stability. The Cloudtec Technology delivers reliable cushioning a for firmer platform during takeoff. This works well with the curved rocker midsole that supports that natural movement of the foot for a an efficient heel-to-toe transition. This CloudTec midsole technology is also utilized in the popular On Cloud running shoes and other ON running shoes. The On Cloudflyer has a knitted liner mesh that increases the shoe’s durability while giving a snug wrap. The no-sew construction keeps foot free from irritation while giving a seamless fit. This shoe has a heel strap that allows an easy entry and a star lacing that wraps the foot securely. Lastly, the shoe has a reflective TPU heel-cap that increases visibility on low-light conditions.